Our photo and slide collection is comprised of two main parts: one is the CSPR Collection (which stands for Chessie System Public Relations) and comprises all of the Official C&O Railway photos that were taken by their public relations department and donated to the C&OHS by Chessie System in the 1980’s. This portion of the collection contains various sizes of black and white and color negatives and slides. The other part is the C&OHS Collection, which also comprises black and white and color negatives and slides, which have been obtained by the C&OHS from a variety of sources, either by purchase or through donation over the years the Society has been in existence. The photographic images in the collection of the C&O Historical Society are available for research and ordering. There are thousands of listings in the database, with some dating as far back as the 1800’s. The collection has black and white, as well as color images, and is comprised of a wide variety of photographic media. Here are a few examples. On the left is the image as you would see it in our digital gallery. On the right is the detail you see when viewing the print. Due to factors such as user connection speeds, bandwidth usage, and space limitations we reduce the size of our online images. While this reduction makes it possible to bring you the digital image gallery, it also greatly affects the quality of detail you see on your screen. 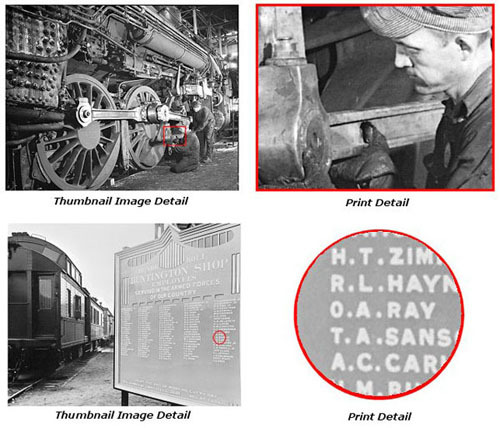 When ordering a print you get full quality, high-resolution detail.